Getting There & Making the Most of It! 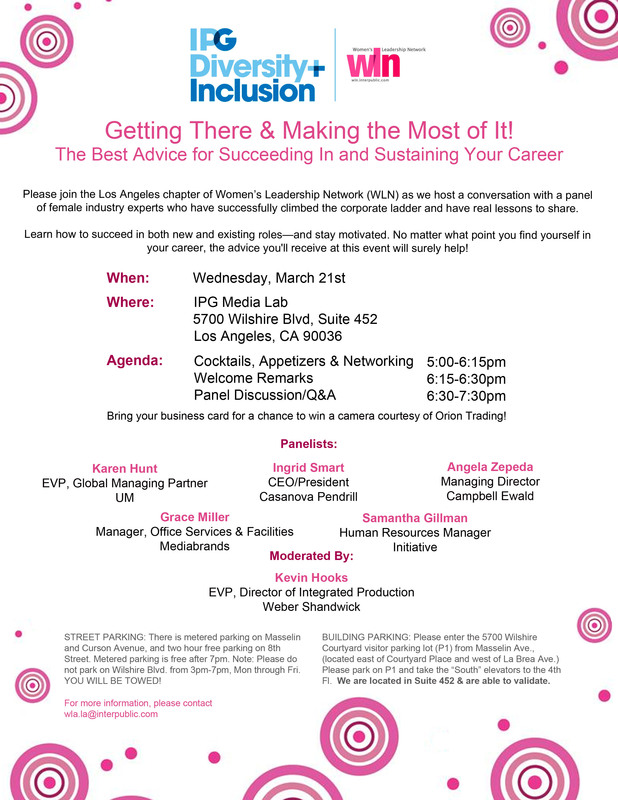 Join the LA chapter of the Women’s Leadership Network for a conversation with a panel of female industry experts who have successfully climbed the corporate ladder and have real lessons to share. The panel will be moderated by Kevin Hooks, Executive Vice President at Weber Shandwick. Panelists include Karen Hunt, EVP, Global Managing Partner at UM; Ingrid Smart, CEO/President at Casanova Pendrill; Angela Zepeda, Managing Director at Campbell Ewald; Grace Miller, Manager, Officer Services & Facilities at Mediabrands and Samantha Gillman, Human Resources Manager at Initiative.